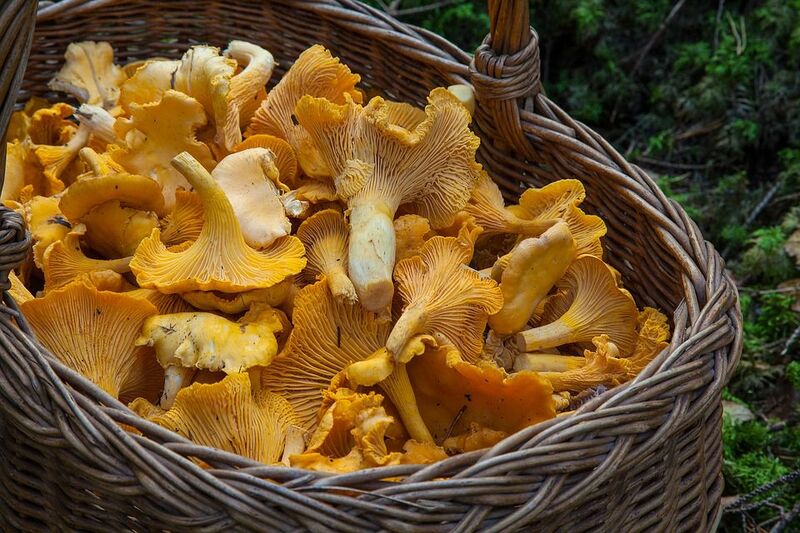 Chanterelle mushrooms (Cantharellus species) are prized by wild mushroom hunters and restaurant chefs, but are only available for a few months of the year. Pickling is a time-honored way of preserving chanterelles for year-round enjoyment. Clean your chanterelle mushrooms. Ignore the warning you sometimes hear never to use water to clean mushrooms - it's fine to give chanterelles a gentle scrub in clean water to remove any dirt. Slice off any moldy or dark spots. Pickled chanterelles look especially attractive in the jar (and on the plate) when you can see their funnel shape and curled edges. So leave small ones whole, and only cut larger ones in half or at most quarters. Heat a large skillet over medium-low heat. Do not add any oil or butter. Add the mushrooms and cook, stirring frequently, until the chanterelles begin to release their juices. Because chanterelles are relatively dry mushrooms, this will only take about 5 minutes. Add 1 teaspoon of the salt. The salt will draw out any liquid left in the mushrooms. Once this starts to happen, add the remaining teaspoon of salt along with the vinegar, water, sugar, thyme, and spices. Crank the heat up to high and wait just until the liquid comes to a boil. Give it a stir or two while it's coming to the boil. Reduce the heat to medium-low and simmer for 5 minutes. Use a slotted spoon to transfer the chanterelles to a clean glass jar. Pour the brine over. Make sure the mushrooms are completely covered by the brine. Cover tightly. At this point you have two choices: you can simply transfer the jar to the refrigerator. The pickled chanties will keep for at least 6 months. For longer storage at room temperature, use a canning jar, making sure that the mushrooms are completely covered by the brine and that there is half an inch of headspace between the surface of the food and the rim of the jar. It is not necessary to sterilize the jar for this recipe. Wipe the rim of the jar dry with a clean towel or paper towel. Screw on the canning lid and process in a boiling water bath for 15 minutes (adjust the time if you are ​canning at high altitude). Unopened, the pickled chanterelles will keep for at least one year, but move them to the refrigerator once the jar is opened. Whether you opt for the refrigerator pickle method or take the extra step of canning your pickled chanterelles, wait at least a month for the flavors to develop before eating them.